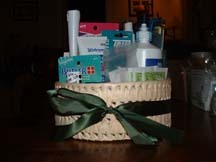 Personalized gifts I crafted for my ladies. 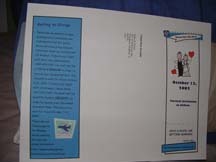 I've ordered my Pocketfolds and Z-Cards (for the programs) from Claudia at Montage Invitation Studio. Don't worry, telling her I sent you won't get me any money back! 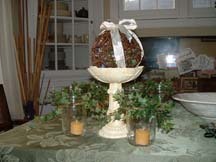 I agreed to put a link to her site in exchange for free shipping! She is flexible and works with you one-on-one, so if you're looking for a source for Envelopments products, give Claudia a try. If she doesn't work out for you but you're still on the prowl for Envelopments products, you can also try Remote Assistance and My Gatsby, which are, like Montage, great little companies run by women who love what they do. I ordered my Adhesive Transfer System from Remote Assistance and would've ordered my Pocketfolds and Z-cards from MyGatsby if Claudia hadn't beat their prices...but she did! 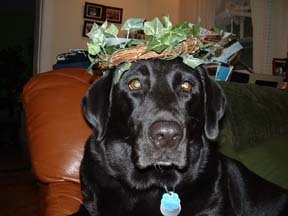 Casey models one of the pew wreaths I've fashioned. Regular invitation. To save paper, I'm printing the invite and the poem excerpt on the same sheet and then will cut them down to size to fit the Pocketfold. 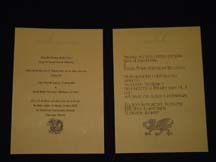 Vietnamese and Welsh invitations. These are both to be printed on one card, Welsh on one side and Vietnamese on the other. I made these using a handy little template I customized in Microsoft Publisher. They're tri-fold brochure style cards shown here opened up. 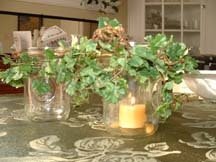 Invitations ~ the Real Deal! 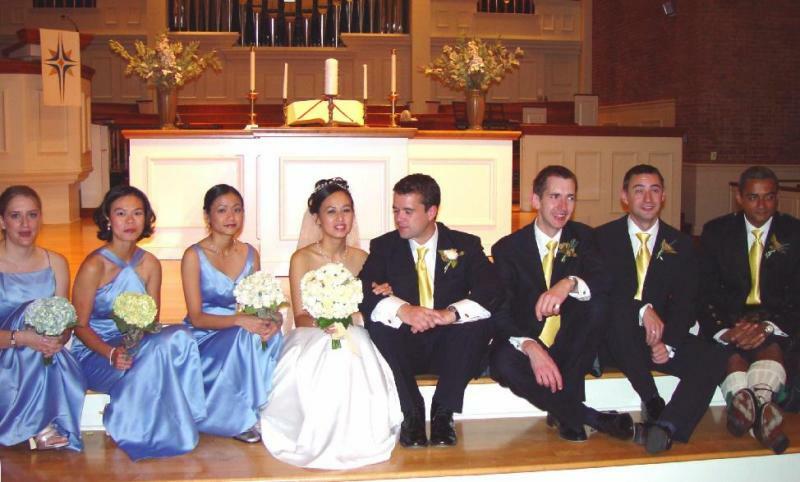 12 August 2002: We sent off the invites this morning! They're going out a little bit later than they should've, but I completely lost track of time until my mom called to remind me that they should've gone out a week and a half ago! These are obviously DIY. LOTS of labor and time and effort, but SO worth it! Monkey was a true gem and stood and hand-cancelled each stamp this morning. 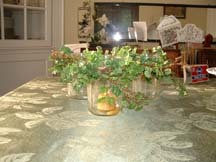 I tried to stay in the pear-greens color scheme of the invites and used three different types of ribbon, all of a similar shade of rich pear-skin green. 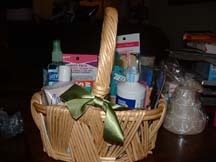 My favorite, I think, is the wide ribbon, though the textured grosgrain ribbon was also gorgeous. I cut tons of ribbon to wrap around the Pocketfold, stuck the ends together using mini glue dots, and hand-wrote each guest's name in copper gel ink. 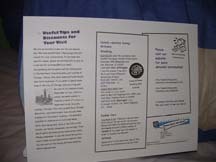 The assembled product: poem excerpt, invitation, and info inserts. The verse is an excerpt from Edward Lear's "The Owl and the Pussycat." Both David and I love it because it captures the spirit of the night we got engaged (on the beach, in the sand, under the Dominican moon). The invitation is relatively simple and modeled after similar styles I've seen on various invitation sites (including the fab Wedding Channel Invitations board). 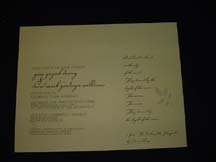 The info inserts include reception card, response postcard, Vietnamese & Welsh invitation wording, hotel and travel info, and maps. 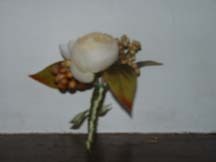 Flower Girl's Pomander. 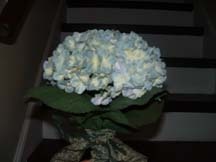 Yep, artificial flowers. 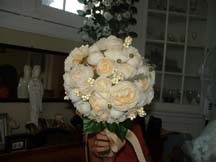 I love, love, love ranunculus. 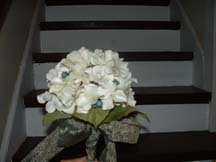 Ivory and white ranunculus with some blue flowerets (forget-me-nots?). Visitors to Bits and Bobs. 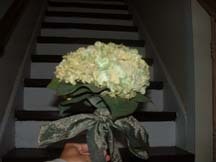 Bride's Bouquet. 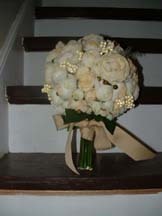 I originally envisioned peonies and ranunculus, but the peonies were hard to work with. Ranunculus and berries is what I ended with. 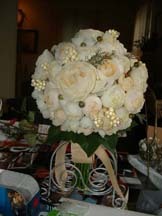 Groom's Bout: ranunculus and berries. 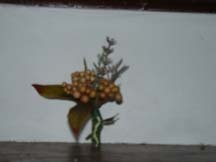 Groomsmen's Bout: Berries and herb sprigs. Bridesmaids Brunch Invitation. I created this little ditty in record fast time (not that I was racing, but I was impressed how easily this came together) using Adobe Illustrator. 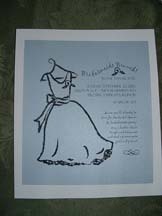 I drew the dress graphic freehand using the paintbrush tool and printed this on iridescent ice blue paper, then matted it to a piece of ivory linen paper. 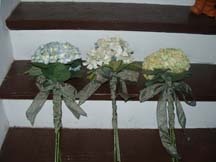 Bridesmaids' Bouquets: hydrangeas in different shades tied in green organdy ribbon. Originally, we were going to have lovely, ecru linen tri-fold covers for our programs. I had ordered 200 ecru linen Z-Cards (of the Envelopments line) from Montage, and from what I had seen on weddingchannel, printing shouldn't have been an issue. But, it was. The weekend before the wedding, I started to print these babies up, getting horrrible jams every single time, no matter how much attention I paid to feeding it through carefully. After visiting several pro print shops, it seemed that even Kinkos (who I did visit for some help) wouldn't be able to help me (crotchety old lazy bastards!). So, we went to plan B, which was to mimic the originally planned look of the square linen cardstock cover, but in bi-fold, rather than tri-fold format. I purchased some gorgeous Italian linen 80 pound cardstock in natural, as well as laid text weight natural paper from Xpedx and made photocopies of the program insides at Kinkos and printed each cover from our laser printer at home. I used Illustrator to create the monogram, exported it as a .jpg file, and laid out the program altogether in MS Publisher. Fonts used were Carpenter and Californian. We used the trusty old guillotine cutter to cut everything down to the 5 x 5 square size, and we used a pamphlet stapler (about 40 bucks from Office Max) to keep it all together.